Lotsa 'Splainin' 2 Do: Wednesday Math, back from the dead:The wackiness that is set theory. The wackiness that is set theory. As I have have told my students from time to time, "Math is NOT set up the way it is just to make you crazy. That's a happy little bonus." But there is part of math that made even mathematicians crazy in its infancy and is still reviled by some people who have no business doing mathematics at all, the fundamentalist Christians who insist on home schooling their children. 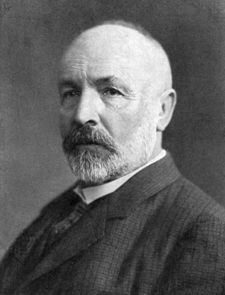 That part of math is set theory and the guy who did the most important early work is the fella in the picture, Georg Cantor. A set is a collection of objects. So far, so good. The cardinality of a set is the number of objects in the set. if two sets have the same cardinality, you can match them up in a one-to-one correspondence. If you have twelve kids at a party and twelve party hats, you can give each kid a hat, no one has to share and there are no unused hats. There are some infinite sets that can be put into one-to-one correspondence with other infinite sets. For example, the cardinality of the positive integers is the same as the cardinality of all integers, positive, negative and zero. Here's the one-to-one mapping. odd numbers (2n + 1) go to the negative of half the even number just before them (-n) . So while it "makes sense" that all the integers is twice as big + 1 as just the positive numbers, multiplying infinity by 2 or 3 or even squaring infinity doesn't make a bigger number. But this first infinity is just the beginning. There are some infinities bigger than others. It would be hard to show the proofs on a blog, so I'll ask you to take my word for it. Cantor knew the stuff he was doing was goofy, and instead of using the regular alphabet to denote the infinities or even the Greek alphabet, regularly used in geometry and trig, he named the different infinities after the first letter in the Hebrew alphabet, aleph. The smallest infinity is aleph nought or aleph0 and the next size up is aleph1, usually called the countable and the uncountable infinities respectively. The rational numbers are aleph0. The real numbers have more, aleph1. There are infinitely many infinities, but only the first few are the cardinality of things mathematicians find useful. Set theory created an amazing row. Great mathematicians like Henri Poincare hated it. Pretty good mathematicians like Leopold Kronecker hated it. Mathematically astute philosophers like Ludwig Wittgenstein hated it. But Cantor had his adherents as well, most notably David Hilbert, who in his day was the Biggest Damn Deal in mathematics. John Von Neumann, the greatest mathematician of the generation after Cantor, Hilbert and Poincare, came up with Class Theory to turn some of the messiest sets into classes. Classes followed different rules than sets and calmed down the people who were trying to make a new paradox every week. Pretty much, for all its oddities, mathematicians now are happy to have set theory as a basic concept of the field. If you are wondering how much anti-Semitism is involved in the objections to Cantor's work, it should be noted that his critics Kronecker and Wittgenstein are Jewish and his great supporter Hilbert is not Jewish. His critic Poincare was not a Jew, but not an anti-Semite either. Another favorite part of the Cantor story is he ended up in the nuthouse. People who understand mental illness better now say his diagnosis looks like bi-polar disorder and was NOT brought on by the amazing level of criticism heaped upon his work by well-respected colleagues. So why do people who write books for home schoolers hate set theory? They believe in just one infinity, and that infinity is their One True God. I only recently heard about the hatred from the people trying to keep their kids under their thumbs for the love of Jeebus, but this coincides with me thinking for the first time about the additive group R/Q, the real numbers with the rational numbers removed, which is to say an uncountable infinity with a countable infinity removed. There are uncountably infinite elements of this group, but the only one we can name is 0. The rest are infinitesimally close to zero. It's real Through The Looking Glass stuff, and it comes from one of my favorite parts of practical math that has its roots in theoretical math, group theory. This is just one of the reasons when someone asks "What are you doing for fun?" I often answer "You really don't want to know." Welcome to Hilbert's Hotel. Yes, I know it says "No Vacancy", but let me shuffle some folks around and then I'll have a room for you. Bless you, I don't deserve a mathematically competent proof reader, but I have one just the same. And then I will tip over my cereal bowl and leave the room. Even less than infinity can go wrong. With as little skill as I have shown at keeping myself healthy, there is the possibility I could live to be ninety. How will I have enough cash to live to be ninety? I have no clue. Wouldn't R/Q also contain numbers like pi and e, not just ones infinitesimally close to zero? Pi and e are represented by pi - j and e - k, where j is the rational number closest to pi and k is the rational number closest to e. The problem with these two rational numbers is they are kind of like Y'ahw'eh or Voldemort, their names can never be said, but not for religious or magical reasons, but for a mathematical reason. If you actually choose "the rational number closest to pi", I can always find one closer. Pi and e sound like a yummy dessert to me. The rest is jibberjabber to my words-not-numbers brain. Hey I heard Scott Dissick got dumped by Kourtney aka Bristol Kardashian. Dear KZ: I went back to check. n the two years I followed the tabloids, Kourtney and Scott broke up 13 times. I thought with the chin job, Bristol was trying to be Bristol Kardashian.